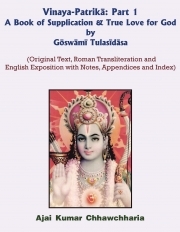 Description of "Vinai Patrika: Part 1- A Book of Supplication & True Love for God by Goswami Tulsidas"
This is the 1st Part of the 2-Part Book titled ‘VINAI PATRIKA’. As the name suggests, means ‘prayerful and humble submission to Lord God in the form of a petition or letter’. It is a remarkable “Book of Supplication and True Love for God” in the form of exceptionally beautiful Prayers coming directly from the core of one’s heart, and it is composed in the style of an excellent poetry, with its verses set to different Raagas (tunes) of classical Indian music. It was penned by the great saint-poet of India known as Goswami Tulsidas in a style wherein one communicates his feelings and emotions directly to the Lord God without any intermediary. In this sense, as well as in its spiritual content, depth and import, Vinai Patrika is quite like the Book of Psalms in the Holy Bible, and is unparalleled in the realm of classical devotional literature ever written in the Hindi language in India. The 279 verses of pristine beauty of the Book ‘Vinai Patrika’ start with Hymns dedicated to different deities as is the usual pattern of a book of a spiritual and devotional nature (verse nos. 1-42, 57-63), and to the glories of Lord Ram (an incarnate Supreme Being) to whom this Book is dedicated, as well as to His Holy Name (verse nos. 43-56, 64-70). Then comes the wonder of this Book, for the rest of its verses, from no. 71 to 279, takes us on a spiritual journey that fills the heart spontaneously with profound bliss, joy and ecstasy, verses that touch and stir the very core of one’s heart and makes one so emotional and sentimental that tears of love and devotion for the Lord God would well-up in the eyes and leave the throat chocked with emotion. As we move along charmed and enthralled by the wonderful text of Vinai Patrika, we come across splendidly narrated and most apt metaphors, similes, analogies, aphorisms and parables, some interwoven in the verses so as to mingle with them almost imperceptibly, and some others standing out with entire verses devoted to them. Some such brilliant examples are—The Village (vrs. 145, 210/4), the Palanquin (vrs. 189), The Womb (vrs. 136), The Lunar Fortnight (vrs. 203), The Havan (fire sacrifice—vrs. 108), The Kabandh (vrs 238), Aarti (vrs 47, 48), The Bird-Catcher (vrs. 208/2), The Spoilt-Coin (vrs 178), Holi (vrs. 203/17), The Bamboo (vrs. 114), The Parrot (vrs. 197/2), The Journey (vrs. 83, 136), The Dangling Sword (vrs. 200), What ‘If’(vrs. 151), The Delusory Dance (vrs. 91), The Golden Opportunity (vrs. 202), Lanka (vrs. 58), The Forest (vrs. 59) etc. Then the poet-philosopher tells us who are our enemies (vrs. 187), who is a true friend (vrs. 174) and who is false (vrs. 147), the reasons for miseries (vrs. 168), the culprits occupying our heart (vrs. 125), various means of salvation (vrs. 103), utility of the human body (vrs. 201-202), how foolish are we (vrs. 92), why is there no peace (vrs. 246), why am I unhappy (vrs. 244), and the amazing list goes on and on in undulating waves that would take the reader on a journey of bliss and ecstasy unbound. Reviews of "Vinai Patrika: Part 1- A Book of Supplication & True Love for God by Goswami Tulsidas"